When it comes to paving for your business facilities there is only one company to contact in the Dallas and Fort Worth Region. Renco offers paving services for both asphalt and concrete. Our teams mission is to make it easy for your employees and customers to safely drive onto your premises, park their cars, and walk into the building. Renco Construction offers just a variety of solutions for hard surfaces to customers across the Dallas Metroplex. Through commercial asphalt paving, repair, and sealcoating, we make your business safer and easier to access. ADA Ramps - Also known as handicap ramps, these structures allow those who use wheelchairs, crutches or scooters to access your property with ease. We build these ramps in whatever configuration is most convenient to your company, providing the proper traction to keep all who use them safe, no matter the weather. Parking Lots and Roads - Whether used to construct the entire surface or for certain sections of your property, concrete provides a strong surface to support the weight of cars, trucks and vans. We can construct concrete parking lots and roads of all sizes, ensuring that each surface has the traction for safe, precise driving. 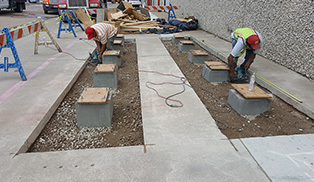 Sidewalks - From providing a safe path into your office to helping visitors navigate a vast outdoor property, sidewalks are necessary for a multitude of business purposes. We construct solid sidewalks with plenty of traction in any size or shape needed. Whether you need specialty concrete work, major asphalt resurfacing or just repairs its Renco Construction they do it all. Renco does a great job, it is always high quality work, done on time, on budget and trouble free because Renco handles it all. I have had Renco do work for me for many years. Give Renco Construction a call you will be glad you did! The Renco team has always put safety first, providing surfaces with the integrity and traction to prevent accidents under all circumstances. These efforts have proven highly successful, keeping businesses and their employees safe throughout the DFW area. Don't just take our word for it - the National Council of Compensation Insurance has awarded us the highest safety rating possible! Combined with the testimonials of our many previous customers, we make it clear that we know how to keep you out of harm's way. Regardless of the size of your job, Renco is equipped with the manpower and expertise to get your job done on-time and on-budget! We are fully bonded and carry full worker's comp insurance on all our employees. If your looking the best paving company in Texas, then give us a call.